(X-Men 2099#28 (fb)) - After discovering his mutant ability to reanimate dead tissue, Garth Simenon sought revenge on his former employer Zail Haddad who he blamed for the loss of his comrades during an accident in a biowaste treatment plant. While destroying Haddad's bioprocessing facilities in New Jersey, Simenon, now calling himself Graverobber, discovered a chamber that held a quartet of mutant corpses (who Haddad had preserved in the interest of science). (X-Men 2099#28 (fb) - BTS) - The Graverobber saw the foursome as the perfect instruments for his revenge and reanimated them. He brought back Arcadian, able to kinetically charge objects, Catscratch, a feral mutant with razor-sharp claws, Ember, a flying, firewielder and the Russian who had metal skin and superstrength. The Graverobber held the reanimated corpses under his control, although they seemed more than willing to comply with his every order. (X-Men 2099#28 (fb) - BTS) - The Graverobber learned Zail Haddad had taken refuge in Halo City where his daughter, the X-Man Cerebra, was residing. This led him to decide he wanted to build an empire of the dead within the metropolis. 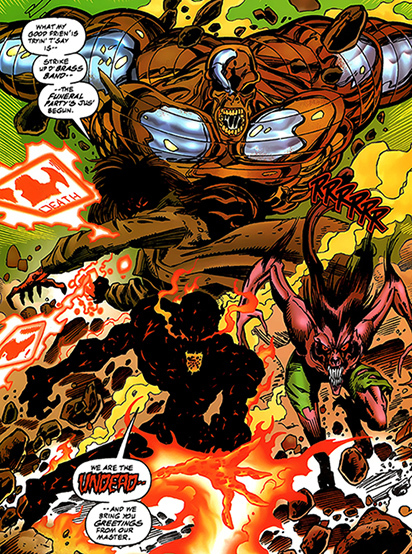 In order to achieve that goal, he needed the powers of the X-Man Skullfire (Timothy Fitzgerald) which he planned to use to steal the energy generated in Halo City and turn it loose upon the living. (X-Men 2099#26 - BTS) - Graverobber figured he needed a way to lure Skullfire, that's why he ordered his Undead to exhume the corpse of the dead X-Man Serpentina. (X-Men 2099#26 (fb) - BTS) - The Undead located Serpentina's body in the outskirts of the Nevada desert. Once the Russian broke her corpse out of the crystal coffin, they decided to leave her and focus their attention on destroying a local diner called Mom's. (X-Men 2099#26) - Graverobber arrived on the scene only after the Undead had killed every single person in the diner. He asked them about their mission and ordered them to bring Serpentina's corpse to him. (X-Men 2099#27 (fb) - BTS) - Once she was reanimated by Graverobber, Serpentina fell under his control and joined the Undead against her own will. (X-Men 2099#26 - BTS) - Joined by Serpentina the Undead moved out to Halo City to find Haddad and the X-Men. (X-Men 2099#26) - The Undead, minus Serpentina (who hid in the shadows) destroyed a local clinic in Halo City to get the X-Men's attention. Their sudden attack caught the X-Men off guard, allowing the Undead to gain the upper hand. Arcadian took Cerebra to the side telling her their master wanted her father. At the same time, Skullfire followed Catscratch into an alley where he was lethally shot by Serpentina's venom stinger. (X-Men 2099#27) - Having completed their initial mission, the Undead fled to the maintenance tunnels underneath Halo City where they watched as the Graverobber turned Skullfire into one of his "zombies". Graverobber and the Undead were unaware reporter Gunnar, on assignment from alternative newsservice Astronet, witnessed the reanimation. While the Graverobber worked his powers on Skullfire's corpse, the Russian and Ember returned to the surface to wreak havoc in the streets, luring in the X-Men Meanstreak, Cerebra and one of Haddad's Stark/Fujikawa mechaguardians. While Cerebra successfully managed to hurt Ember with a neural scatter-shot, the Russian severely damaged the mechaguardian causing it to malfunction. The two X-Men chose to disarm the malfunctioning mechaguardian while the two Undead escaped. Upon returning to the maintenance tunnels, Ember discovered Gunnar and seemingly killed him with his fire-powers. 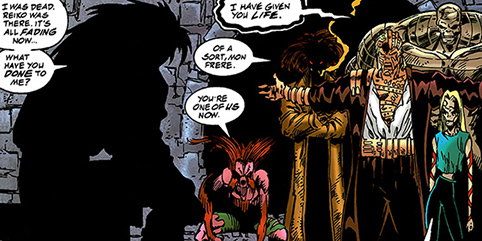 After this, Skullfire returned to "life" fully under the control of the Graverobber and ready to join the Undead. 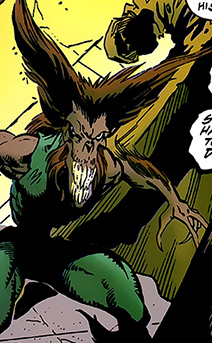 (X-Men 2099#28) - Deciding to make a big impact on Halo City, the Undead appeared during a concert of the Disinterred where they wound up killing the band. X-Man Sham and her friend Quiver who were present for the concert were quickly taken out by the Undead which allowed the Graverobber to take the stage. In an attempt to get his hands on Zail Haddad, he offered the citizens of Halo City life beyond death if they would deliver Haddad within the next twenty four hours. Now back in the maintenance tunnels of the city, the Graverobber explained his empire of the dead plan using Skullfire's powers. But when Skullfire showed a sign of his old self, the Graverobber grabbed him by the throat and took away part of his lifeforce to show the former X-Man he was the one in control. Just then La Lunatica revealed her presence and attacked the Graverobber. She was quickly defeated, after which the Arcadian asked if Graverobber wanted to turn La Lunatica into one of his undead. Fully controlled, Skullfire used his mutant abilities to plunge Halo City into darkness. (X-Men 2099#28 - BTS) - Morphine Somers, who held a powerful position of authority in Halo City, had enough of the Undead's terrorist attacks and chose to extradite Haddad despite the X-Men's orders. Somers confronted Haddad and captured the man. (X-Men 2099#29) - After Halo City was plunged into darkness, the X-Men finally managed to track down the Undead. They used all of their might in the battle against the Undead and the Graverobber even though Meanstreak and Krystalin were shocked to see their former teammate Serpentina, who reluctantly fought the X-Men. Cerebra seemed to strike a nerve when she used her psionic abilities on Graverobber but was quickly attacked by the Russian. Just when the Russian was about to snap Cerebra's neck she was rescued by Morphine Somers who decided the time had come to play his ace. Somers used his power to rapidly age the Russian, until he turned into a pile of dust. This got the Undead and the Graverobber's attention. Somers explained he'd come to negotiate and revealed he'd brought Zail Haddad. But when the Graverobber took hold of Haddad, Somers activated his trap; Somers had wired Haddad's restraints with enough neural charge to down an elephant. The electric shock took down both Haddad and the Graverobber. As his nervous system was short circuited, the energy field between him and the Undead was broken as well. The Arcadian, Catscratch, Ember and Serpentina instantly dropped dead while Skullfire remained alive. 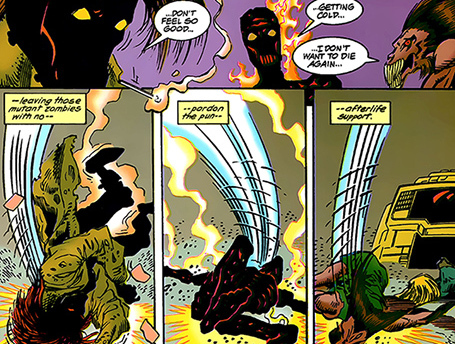 Rid of the Graverobber's influence, Skullfire returned to the X-Men who wound up cremating Serpentina's corpse and scattering her ashes off a cliff. (X-Men 2099#29 (fb) - BTS) - Somers put the Undead (Arcadian, Catscratch and Ember) and the Graverobber on ice. He'd promised the bodies to Herod in exchange for lifting a contract on his life. (X-Men 2099#29) - When Herod's Puzzle Samurai came to Halo City to collect the bodies, X-Man Cerebra witnessed the exchange and confronted Somers. But while the cargo was well on its way, Herod's transport was shot out of the air by Doom who refused to let Herod add Graverobber to his collection of forbidden technology. Comments: Created by John Francis Moore (writer), Ron Lim (pencils), Harry Candelario (inks). With Doom's death in 2099: World of Tomorrow#7 it seems unlikely the Graverobber or the Undead will ever resurface. I really like how John Francis Moore was able to create teams of mutants (or degens) reminiscent of present day X-Men. The Arcadian was patterned after Gambit (more on that in his sub-profile). The metal skinned Russian strongman is of course an homage to Colossus while Catscratch felt like characters such as Wolfsbane and Feral. 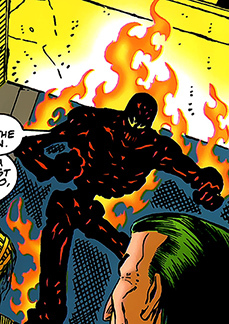 Ember resembled characters like Sunfire and Sunspot. Perhaps he inspired Jay Faerber to create Fever Pitch. 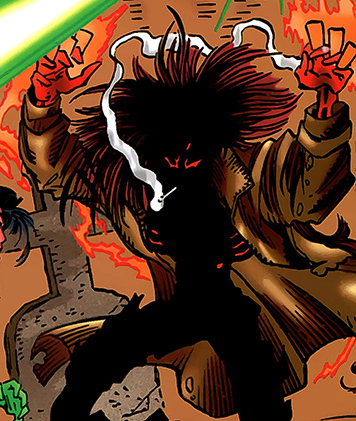 As for the zombie raising Graverobber, it's no coincidence his name "Garth Simenon" is awfully similar to Earth-616's Zombie Simon Garth. The Arcadian was a mutant with the ability to kinetically charge objects. Before his time with the Undead the Arcadian grew up with his father in New Orleans who taught him to never get close to anybody. The Arcadian recalled fighting against Del Ruiz's X-Men (which would be around the time of the Great Purge). The causes which led to his death remain unrevealed, however he did end up in the bioprocessing facility owned by the Golden Harvest in New Jersey. Zail Haddad, owner of the Golden Harvest claimed he kept the Arcadian's corpse amongst those of other mutants in the interest of science. After his corpse was reanimated by the Graverobber he followed him in his siege against Haddad and the X-Men in the hopes of creating an empire of the dead. After his defeat his reanimated corpse (alongside that of Catscratch, Ember and Serpentine) collapsed, losing all life. His corpse is now in the hands of Doom. Note: So is the Arcadian actually a deceased Remy LeBeau or perhaps one of his descendants? 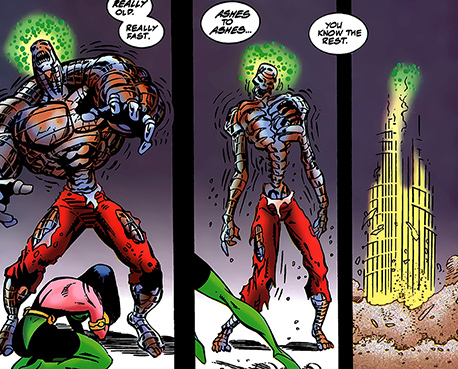 In X-Men 2099#28 Haddad stated none his mutant corpses dated back further than 2040. That answers the question whether or not the Arcadian was Gambit. Then again, given Marvel's sliding timeline it by now could be Remy since it's not unthinkable he'd survive until 2040. At any rate, the Arcadian's thick Cajun accent and similar powerset strongly suggests a close relation to Gambit. Catscratch was a mutant with animal agility, heightened senses and razor-sharp claws. Nothing is known of Catscratch's life prior to her death after which she ended up in the bioprocessing facility owned by the Golden Harvest in New Jersey. Zail Haddad, owner of the Golden Harvest, claimed he kept Catscratch's corpse amongst those of other mutants in the interest of science. After her corpse was reanimated by the Graverobber she followed him in his siege against Haddad and the X-Men in the hopes of creating an empire of the dead. After his defeat her reanimated corpse (alongside that of the Arcadian, Ember and Serpentine) collapsed, losing all life. Her corpse is now in the hands of Doom. Ember was a mutant who could generate fire and fly. When he used his powers, his body looked burned-out. Nothing is known of Ember's life prior to his death after which he ended up in the bioprocessing facility owned by the Golden Harvest in New Jersey. Zail Haddad, owner of the Golden Harvest claimed he kept Ember's corpse amongst those of other mutants in the interest of science. After his corpse was reanimated by the Graverobber, he followed him in his siege against Haddad and the X-Men in the hopes of creating an empire of the dead. After his defeat his reanimated corpse (alongside that of the Arcadian, Catscratch and Serpentine) collapsed, losing all life. His corpse is now in the hands of Doom. Nicolai was a mutant who possessed super strength and metal skin, even though Nicolai was big, he moved very fast. Nothing is known of Nicolai's life prior to his death other than that he was born in Russia. After his death, he wound up in the bioprocessing facility owned by the Golden Harvest in New Jersey. Zail Haddad, owner of the Golden Harvest claimed he kept the Russian's corpse amongst those of other mutants in the interest of science. After his corpse was reanimated by the Graverobber, he followed him in his siege against Haddad and the X-Men in the hopes of creating an empire of the dead. The Russian was eventually killed and turned to dust by Morphine Somers' mutant aging powers. Note: It's been unrevealed if the Russian could turn his metal skin off like "our" present-day Colossus. During his appearance he never spoke, perhaps he lost his ability to speak when the Graverobber reanimated his corpse. If so, it would explain why he was just called the Russian, the Graverobber could've learned his real name from the dossiers in the Golden Harvest facility. Just like the Arcadian looking like Gambit, the Russian pays homage to Colossus.